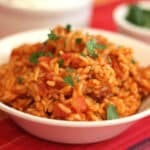 This spicy and flavorful Spanish (or Mexican) Rice was a great side dish for the enchiladas that we enjoyed a few nights ago. The rice turned out a good amount of heat and the tomatoes balanced the dish well. Even my non-spice eater in the family ate two helpings of this rice. I used 2 full tablespoons of red chile powder in this recipe. Feel free to reduce the amount slightly, if you prefer a little less heat. I made burrito bowls with the leftover rice the following day and it was delicious that way as well. In a large skillet, combine the rice and the chicken broth and bring to a boil. Reduce heat to a low simmer and cover with lid. Simmer for 18-20 minutes, just until done. Transfer to a separate dish and cover with lid to keep warm. Melt the butter in the hot skillet over medium high heat. Add the onions and saute until translucent and slightly browned, approximately 5-6 minutes. Add the garlic, toss to saute and cook about a minute longer. Add the tomatoes and the spices and stir. Cover with lid and simmer on medium low for 10 minutes. Add the cooked rice to the tomato mixture and stir well to combine thoroughly. Turn off heat and cover with lid to keep warm. If desired, garnish with cilantro just before serving. Enjoy! I have a recipe for Spanish Rice but it has mince, bacon, kidneys and liver in it. Also onions, tomato soup, peas, mushrooms and medium strength curry powder but i add more as I prefer it hotter. Oh and Long grain rice lol. My Nan gave it to my Mum when I needed to have more Iron in my diet, I have a portion of spinach with it. I love it. I want some of that right now! Mexican rice is one of my favorites, although the rest of the family doesn't share my love. 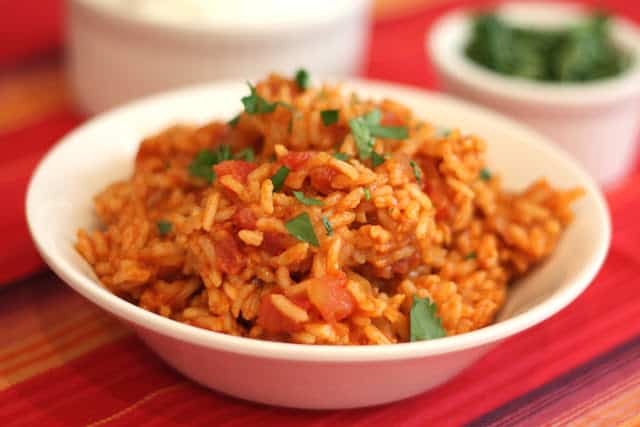 Before I banned box rice mixes I used to make the Spanish Rice where you add a can of tomatoes - my favorite. This looks exactly like that rice. Pretty pic, Mary! I've used a Spanish rice recipe handed down by my Grandmother and Mom all my life, but this looks so good that I'm trying it. It's in my rice cooker right now. I did change it a little in that I stirred a splash of oil into the rice and then mixed in all the spices and onion before cooking. It was a method that worked at the Mexican restaurant I worked at, hopefully it works here too. Made This Tonight , Was Wonderful & A Keeper. How many servings does this make? I'm in the process of cooking this now. The yield is 5-6 servings. Enjoy! Hi! Just the kind of recipe I was looking for! I love your blog! Thank you! Question: is the "chile powder" called for the kind that has a blend of spices and salt in it? Or just a plain powder of one kind of "chile pepper" of choice? I have a variety of both types. Thanks! You'll want to use a plain chili powder, not a chili or taco seasoning blend for this rice. I hate when a recipe doesn't turn out right. We really enjoy this recipe. What didn't work for you? Did you substitute anything? or follow the recipe exactly?